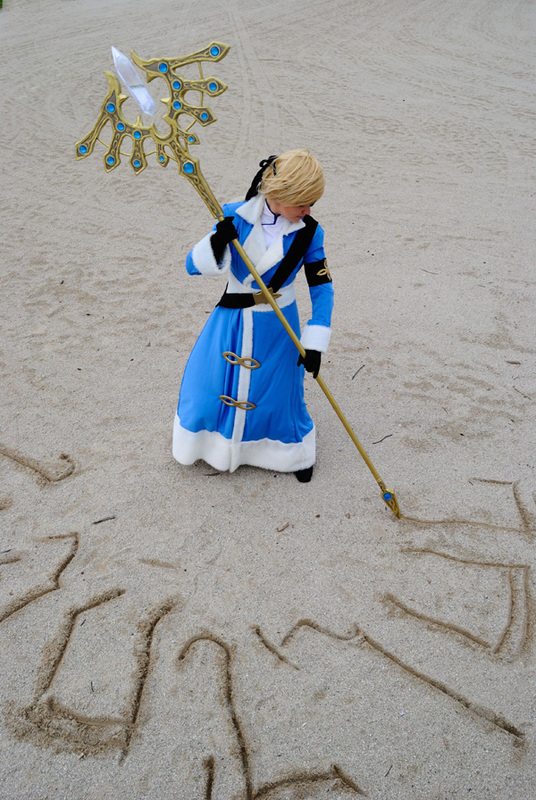 Many thanks to “…And Sewing is Half the Battle!” for sharing this Worbla tutorial with us! 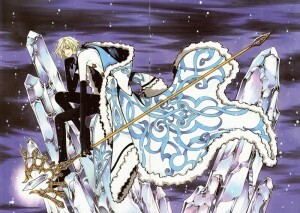 Fay D. Fluorite from Tsubasa: RESERVoir CHRoNiCLE. Artwork by CLAMP. Please note: When I made this prop (in a three-day panic before Gen Con) I was not intending to produce a tutorial on the method, so the only photos I have are the ones I took for my own documentation. I’ve had so many questions and requests that I’ve tried to put together a tutorial anyway, but since there are several steps that I don’t have any pictures of, you’ll have to employ your reading comprehension skills to follow along. Paper pattern pinned to foam and traced with marker. The paper pattern was then secured to a square of 1″ thick insulation foam with straight pins and traced with permanent marker. Make sure whatever you use to mark or make notes on the foam has a soft tip, as ballpoints or pencils can cut into the foam surface. 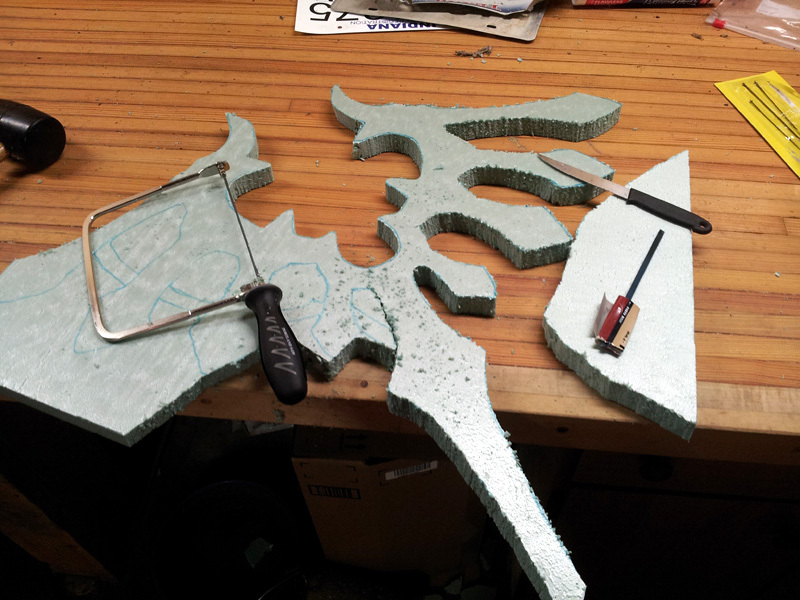 Cutting foam using coping saw (left) and steak knife (right). Once the basic shape was cut, I shaved down any areas that weren’t symmetrical and used sandpaper to smooth the edges. 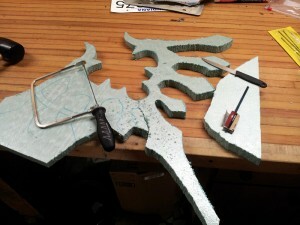 I also cut down and beveled the spikes that point inward toward the floating crystal. Since the dowel rod was the same diameter as the foam, I cut a one-inch-wide slot from the center of the headpiece and tapered the sides down. To keep the Worbla from warping over this uneven section, I cut a piece of thin plastic (actually an old temporary license plate — you can see the numbers showing through in some later pictures) to cover the break and provide a smooth base surface for the plastic. I used the same technique for the finial at the base of the staff, though I unfortunately don’t have in-progress photos of that piece. 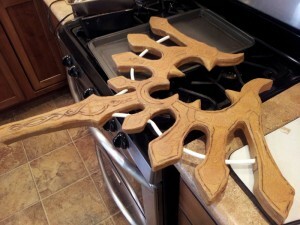 Close-up of Worbla being applied to foam. Front edges have been melted down; back edges (with green lines) are not yet heated. Worbla covering one side of staff, with dowel inserted to check fit. Next I covered the entire surface of the headpiece with Worbla, a low-temperature thermoplastic that softens and behaves almost like clay when it’s heated. 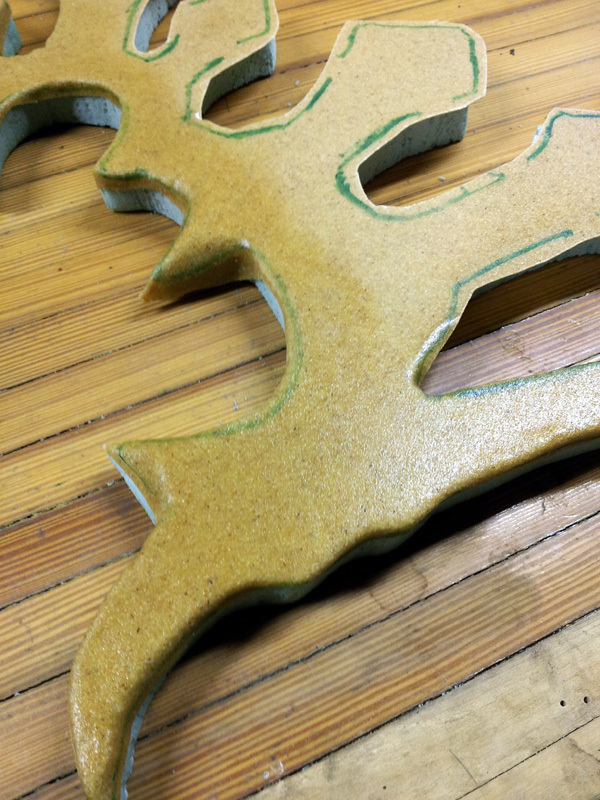 The front and back were traced onto the Worbla from the same pattern I used on the foam, and then cut with about a 1/4″ buffer to provide enough edge coverage (though the Worbla stretches when heated, so there was a lot of recutting and adjustment as I went). I laid out the Worbla and heated one section at a time with a heat gun, folding the edges over and making sure there were no air pockets trapped underneath. It’s important to note that insulation foam will dissolve if you aim a heat gun at it directly, so be VERY careful where you’re pointing the heat when softening the Worbla! The same technique was used for the finial, though I cut and applied the Worbla to run a couple of inches higher on the wooden dowel, as it was going to be permanently attached. 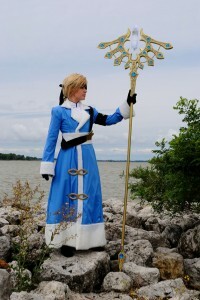 (The staff and headpiece break apart for transit.) 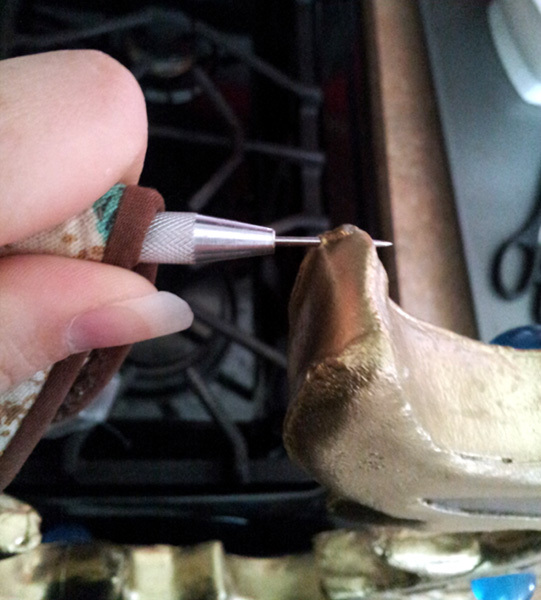 I reinforced the tip of the finial with six to eight layers of Worbla to make it SUPER strong, since that is where all the weight and impact would be focused as it was set on the floor/carried/leaned against things. Once the front and back of the headpiece were covered, I cut long one-inch-wide strips of Worbla (the same as the thickness of the insulation foam) and carefully applied them around all the curved edges. This was one of the most time-consuming steps, as each piece had to be laid out, heated, smoothed, blended at the edges, and measured and cut carefully to fit around the PVC tubes. 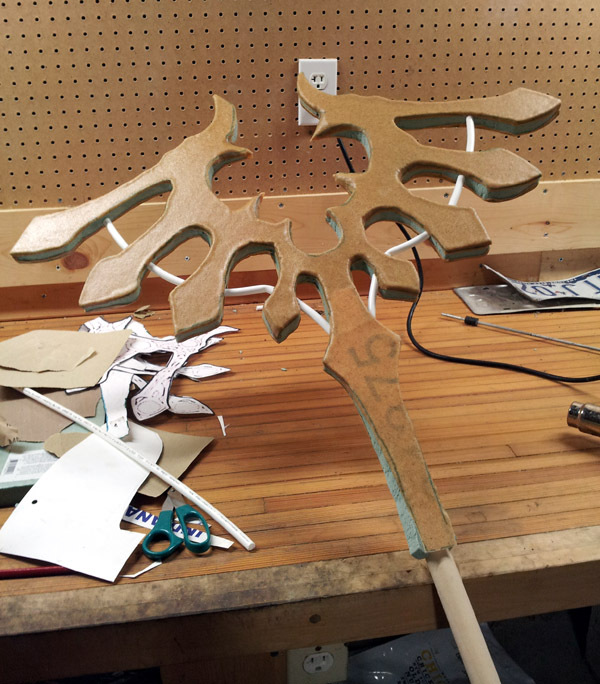 Since Worbla fuses to itself, the edge pieces adhered easily to the overlap from the flat side pieces, and patching around the tubes was easily done using little scrap pieces. Designs cut from Worbla and fused to base layer. 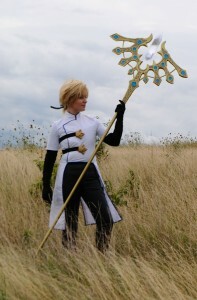 When the entire surface of the headpiece was covered with Worbla, I began cutting the designs that decorate both sides. First was the raised edge that runs around the circumference of the staff. 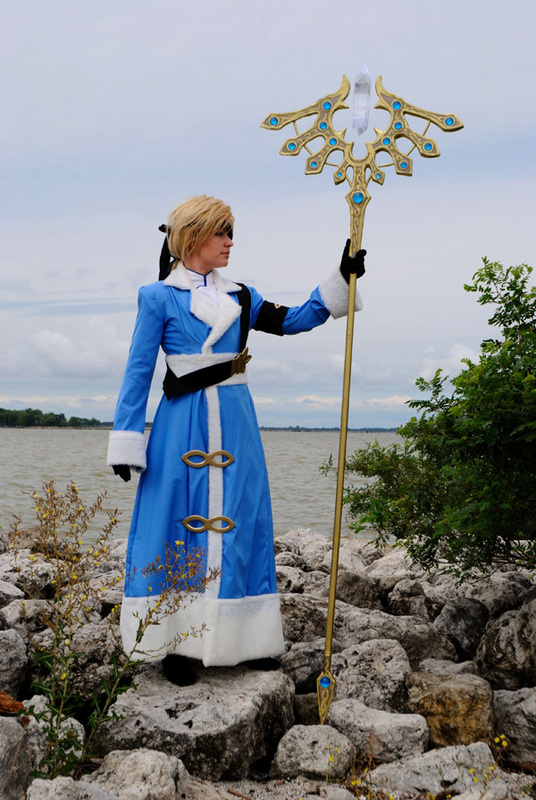 I used the same pattern I’d traced before to cut two more headpiece shapes from Worbla, then trimmed the outer 1/4″ or so of those so I had a piece that would fit exactly around the outer edge of the staff. As before, I laid it out and heated it a section at a time to stick the Worbla to itself. 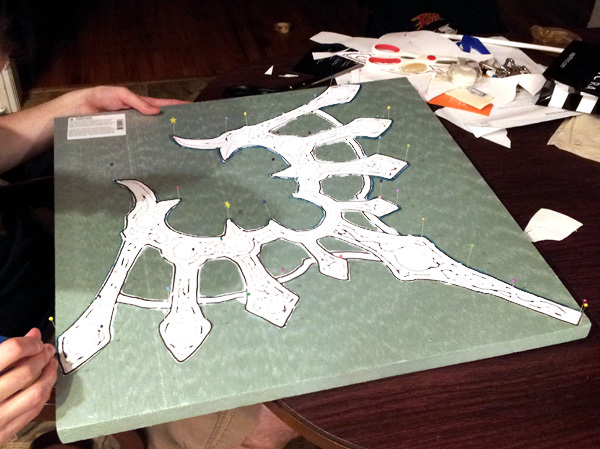 Once that piece was attached, I copied designs from the CLAMP artwork and cut out each tiny curve and jewel setting using scissors. (Do not use your best scissors for this; cutting plastic will damage the blades and hinges. I utterly destroyed two pair of scissors and a set of kitchen shears for this project.) Where the designs overlapped or had more dimensionality, I cut multiple layers of Worbla and stacked them. These pieces were also heated and applied to the base layer of Worbla. The entire staff — headpiece, rod and finial — received at least three coats of extra-thick varnish to smooth the surface, fill cracks and prepare it for painting. Then the whole thing got a base coat of metallic gold spraypaint. The headpiece and finial then got two to three more coats of detail paint. The “background” behind the designs was painted with a custom blend of metallic acrylics in a darker shade to add contrast to the designs; the raised details with twists or loops had shading added to add more depth; and finally the edges had artificial shadows added to make them stand out more from a distance. 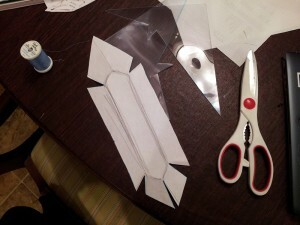 Paper pattern used to make floating crystal. Finished crystal with embedded threads. 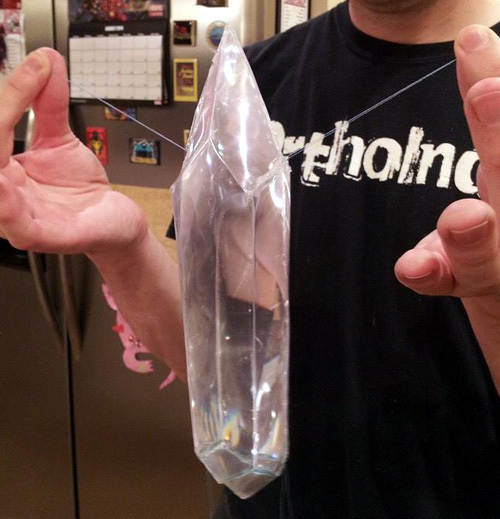 I wanted the central “floating” jewel to resemble a quartz crystal and appear as if it had some mass, so I used plastic magnifying sheets, which distort light in much the same way as a solid crystal. (I got mine at a local store; you can find them many places online as well. Lenticular plastic will give a similar effect.) 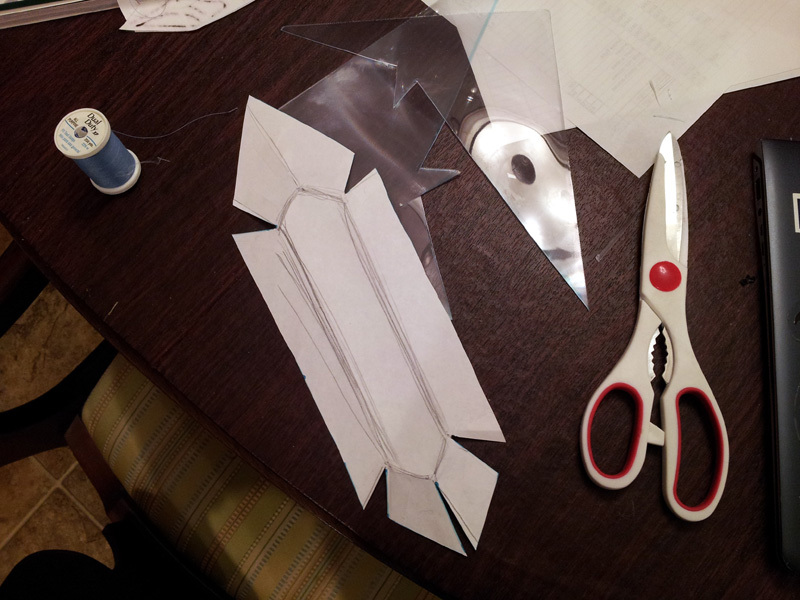 I designed the pattern with paper first, then cut it from plastic, folded it to create facets, and glued the edges together. Punching through plastic and foam with a hot awl. Crystal support threads run through plastic. I waited to install the crystal until the entire staff was finished and painted, as I didn’t want it scuffed or damaged while I was moving the headpiece around to paint. I used a hot awl to melt holes through the points in the top that would support the crystal. (Keep in mind that if you heat part of a metal tool, the entire piece of metal gets hot. Use appropriate heat protection.) 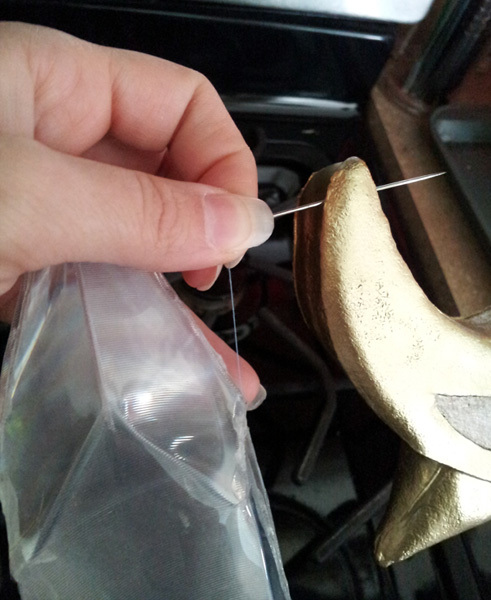 Then I threaded the support threads attached to the crystal through the eye of an extra-long needle, ran them through the holes I’d made with the awl, and tied them off on the outside. I secured the lower individual threads with a dot of glue to keep them from pulling through the holes. There are six points of support (two at each of the top corners and one at each bottom corner), with the threads pulled taut. This tension keeps the crystal from wobbling too much when the staff is carried. The round blue gems were cast in epoxy resin, using a custom blend of dye and glitter for tinting and effect, and were backed with aluminum tape to reflect light. 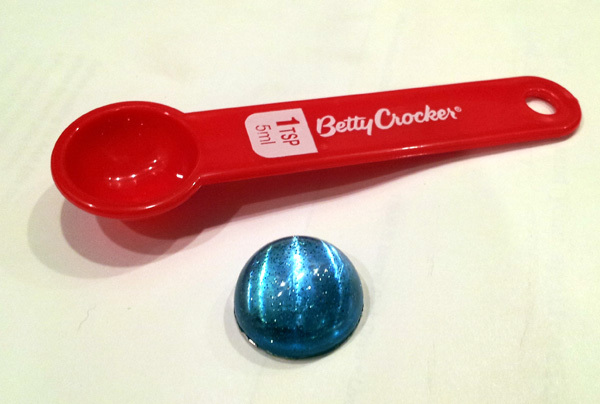 I used plastic measuring spoons to create the graduated sizes. 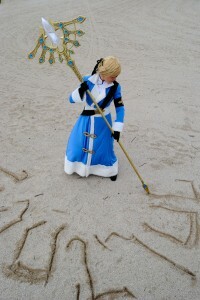 Please refer to my resin tutorial for more information on casting. I had to shorten the staff slightly, as it was initially too tall for indoor use, but now it measures a touch over 8 feet in length. The headpiece slides off for transport, leaving the pole at 6 1/2 feet and the headpiece at around 2 1/2 feet (the overlap is about a foot). Thanks again to “…And Sewing is Half the Battle!” for sharing this tutorial with us!